I am without doubt a diehard fan of the first order of Patricia Cornwell. She's a writer of the finest quality. Absolutely nobody writes forensic crime novels like she does. They are intricately plotted and developed. They are exciting and difficult to figure out. And, her characters are stellar. 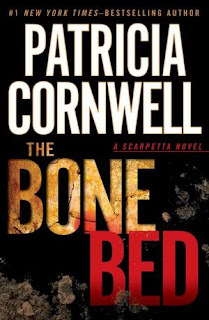 The many characters Cornwell has developed over the 20 books in this series are so in depth and real they are certainly no longer charicatures. Each has a psychological profile and each is interesting in actions and reactions. Kay Scarpetta is a sensitive and brilliant doctor, but she also is a deeply intuitive and caring person. Her neice, Lucy, is one of my favorite characters; wounded and wise, she is a genius at technology but cut off from her feelings. A perfect foil to Kay. Benton, her profiler husband, leaves me wanting more every time I read one of her books...what a tease he is!! And, I can't help adoring the rough and lonely Marino, the detective who's like a bear in a china shop but would take a beating for Kay any day of the week. I love these characters and have begun not to really care what the story around them is at all! I just want to know what they're up to. Which brings me to another thing... This book probably wasn't the best of Cornwell's "mystery" crime novels if one is intent on that prospect. I thought the story from that perspective was a little loose and didn't fit together as well as her stories usually do. The turtle and the "bone bed" insertions in a series of crimes otherwise having to do with matrons in Boston just didn't jell in my mind and in the book. While there was an attempt to wrap them up at the end, it didn't work for me. I thought the very quick wrap up was surprising for Cornwell, and a bit off her game. And, while I enjoyed the "getting there" the wrap up was anticlimatic and disjointed. What really made this book was the interworkings and interactings of the main characters. Caught up in the crime they were solving and in personal relationships that were impacted upon by those issues, it was a book worth reading. What's perfect about Cornwell's telling of this story is that she spends time familiarizing the reader with each of the characters in play so you are truly brought into the action. If you're new to her books, you won't be wondering about them or their backgrounds. I loved this book because of the psychological interactions that were playing out alongside the mystery and the crime they were solving. While I didn't particularly think the pieces of the crime fit well at the end, it wasn't a total disappointment to me, because I enjoyed the character interplay. However, I have to give the book a less than stellar rating for those who would be looking to read a perfect crime novel.